The Culture pour tous forums are gatherings for training purposes under the theme of area cultural development and are held in partnership with about 10 cities or regional county municipalities (MRCs) across Quebec, with funding provided by the federal Department of Canadian Heritage. The objective of the forums is to enhance the leadership, organization and management skills of professional artists and of culture workers—professional or otherwise—working for municipal authorities, companies and cultural organizations. In addition to helping participants broaden their knowledge with experts, they are designed to promote discussions and networking. At the end of the meetings, Culture pour tous provides the representatives of participating organizations with a bank of professional development, advice and assistance hours that they can spend with one or more experts who participated in the one-day forum. 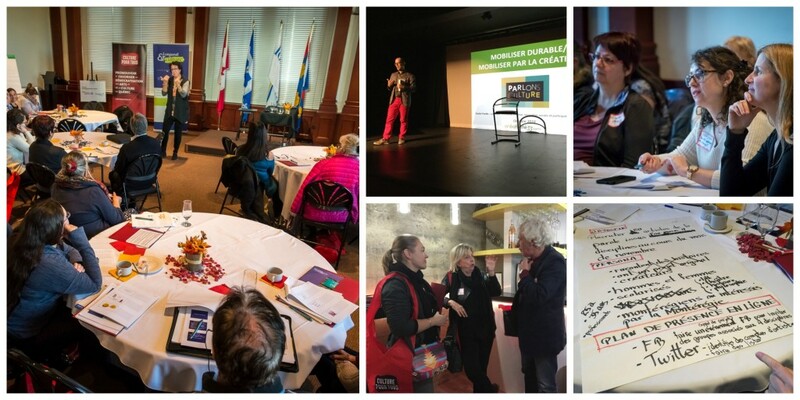 The first forums, held in Longueuil, Gatineau and Quebec City, were a tremendous success in terms of the high number of participants, the variety of cultural practitioners who attended, the quality of the presentations, and the energetic discussions among participants. During the fall, a few members of the Culture pour tous team will accompany the experts as they tour the province to give a series of workshops and conferences. The first stop will be in the Saguenay–Lac-Saint-Jean region, from October 25 to 27. This tour will also take us to the Côte-de-Gaspé, to Rivière-du-Loup, Matapédia, and Terrebonne. For information and to register, contact us.